Needless to say, maybe one of the more discussed topics in our forum is phono cartridges, therefore, I thought this Positive Feedback article was very interesting, and well worth reading in particular for those not interested in breaking the bank to purchase their next, or maybe even their first MC cartridge. The cartridge discussed is the Denon DL103, 55 yrs since introduction, and still maybe the "most performance" for the "least" dollar output in our very price driven hobby. Btw, The Denon DL-103 alone, can be purchased on Amazon for a mere $229.00, which is a fantastic bargain in itself for the cartridge which set the stage for LOMC's in audio. You can't loose purchasing a Denon DL-103 if you never do the modifications. Disclaimer: I have no financial interest in the Positive Feedback site, Denon Corp., nor the manufacturer of Audio MusiKraft products. PS. I forgot to mention the DL-103 is a LOMC(low output moving coil) cartridge. I have a "Modded" DL-103R that I enjoy, it sets in a Potted, Paradox Pulse Guard. A lotta music for the price of admission. I left a reply on that thread and facebook. Harry's take on this product is absolutely more than very worthwhile. Harry's insights on the cartridges that retail below the $1000 price is always worth knowing. 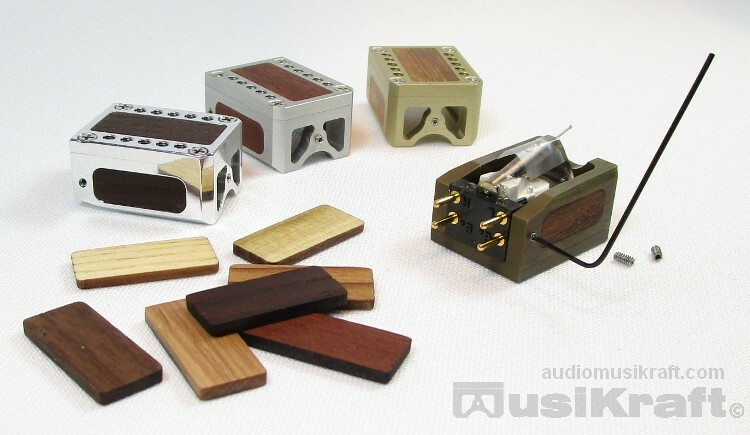 The Positive Feedback review however, is worthy reading because it also explores the additional voicing dimensions of the Audio MusiKraft caseing that can be brought into playback by selecting the various encasing metals, use of the different wood panels, and the use of the different tensioning screws. All together, a very in depth exploration of tuning possibilities for those willing to take the time to explore. The Denon DL-103 was the first LOMC cartridge I used many, many, years ago with my first VPI table, the original Aries Scout, and I still have a Denon DL-103D tucked away that I will very likely never sell. That said, I still feel that even without the Audio MusiKraft package, the Denon DL-103D has a lot to offer anyone, and at the Amazon everyday selling price of $229.00, is one of the greatest values in audio, and I am considering the Audio MusiKraft as a great way to go for a second armwand cartridge. YMMV.